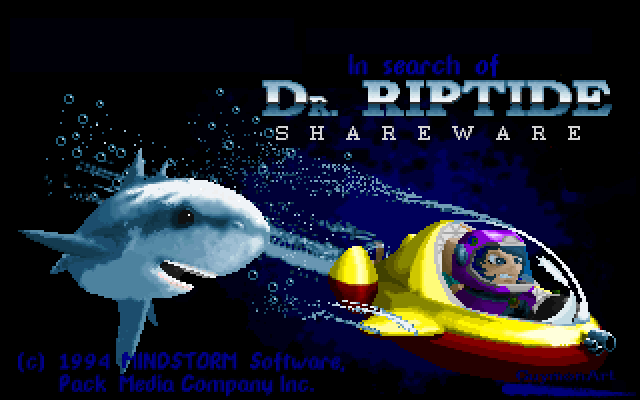 With just about two dozen levels, the DOS action game In Search of Dr. Riptide fits great into a single sitting or two. Although appreciably short, it stumbles over combat and doesn’t get enough good opportunities to try out its coolest mechanic. Dr. Riptide confines the action to underwater tunnels, where behind stretches of caves and bunkers, the disgraced mad scientist Dr. Tiberius Riptide has been harvesting black market seafood. Your covert mission to bring the doctor to justice puts you in the sightlines of evil robots and, improbably, some very aggressive sea creatures. They all but beg to be blown up as you work your way to the center of Dr. Riptide’s lab. Belligerent crabs. Floating keys. This cave has everything! The path to Dr. Riptide is narrow and twisty. Levels typically have a bunch doors to unlock, and the tunnels loop back on themselves through narrow passages and one-way water currents. These areas are fun to worm through, linear and meandering at the same time, if a bit unmemorable. 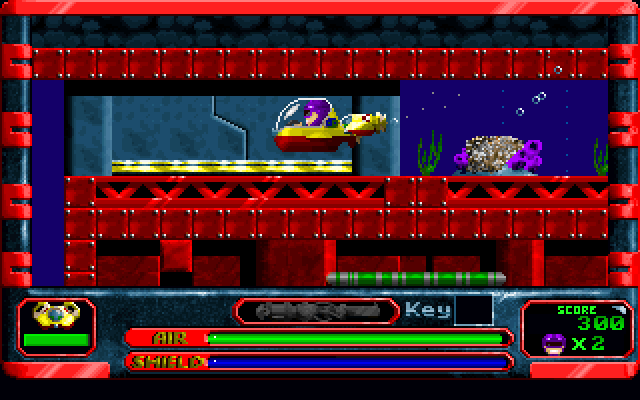 The game has a flat, pillowy appearance like many other DOS games from the period, and only the striking red metal further in Dr. Riptide’s lair stands out from the blue (sometimes purple!) hues of the ocean. Most encounters with enemies happen in tight passageways, which doesn’t leave many options for maneuvering your bulky submarine. When an angry sea dragon shoots at you – or when a tiny fish starts bullying you – all you can do is jam the fire button as fast possible and soak up damage. 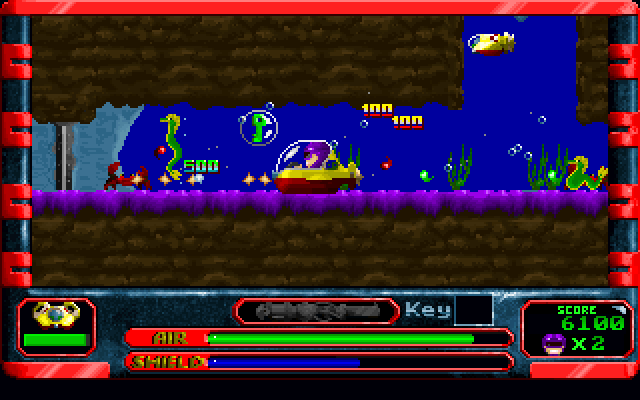 The game’s three boss battles fall in that rut too: the first boss, Oscar the giant fish, fights by ramming you until somebody explodes. There’s potential in an action game that has you constantly pushing forward like a tank, but Dr. Riptide just comes off as sloppy. The real star of Dr. Riptide is JASON, your little remote-controlled sidekick. At any time, you can switch control over to JASON; it’s agile, and controlling it feels like playing a better, nimbler version of the game. JASON lacks the hefty upgradeable weapons of the main sub, runs low on battery quickly, and can’t really interact with anything, so instead, it acts like a tool. It can reach another area through a small tunnel or enter a crowded room that you’re too big to get through safely (though some paths are still too small for it, for some reason). 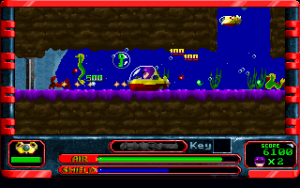 Swapping back and forth between JASON and the submarine brings out the clever intricacy of the game’s level design. They have a neat contrast between big and small, heavy and light. If Dr. Riptide had more coherent action, it could’ve done more with that. The intro to Dr. Riptide advertises the game’s compatibility with the Aura Interactor, a backpack you plug into your speakers that turns bass audio into force feedback. The device seems to work with any audio source, though maybe Dr. Riptide‘s sounds were designed with it in mind. It’d still probably be very uncomfortable to wear.